Next post: Super Mario Sweater? That looks like a frame. I bet it’s an LoL print! Maybe it’s an award to recognize instances of excellence in localization… or lack thereof. 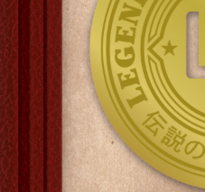 Or perhaps LoL is localizing something and this is the stamp of quality that will be placed on the product. Ogre Battle: The March of the Black Queen? Looks like it says “伝説 の” which could be the start of “伝説のオウガバトル”.